"The time may not indeed be right for an immediate referendum, but it is my belief that it is always the right time to argue for the merits of a republic and prepare the ground for future constitutional change. The road to an Australian republic is a long one, without a timetable, and so the journey must continue. "The case for a republic is as simple as it is compelling, and one that I have been making since my maiden parliamentary speech in 1993." "Deputy Prime Minister Wayne Swan looks set to lose his Brisbane seat of Lilley for a second time, with internal polling suggesting Labor will struggle to retain any Queensland seats north of the Brisbane River at the September 14 federal election. "The results are so dire for Labor that a ''worst case'' scenario suggests Kevin Rudd could become Labor's ''last man standing'' in Queensland, with the former prime minister the only Queensland MP who is seen as likely to retain his seat. "The Queensland polling, taken in recent weeks in Mr Swan's electorate, is believed to show that his primary vote has collapsed to just 28 per cent, compared to 41 per cent at the last election. "Mr Swan has held the seat since 1998, although at the last election his margin narrowed from 8 per cent to 3.2 per cent, with a 10 percentage point fall in his primary vote." Let's hope for the best that could happen. Wayne Swan will lose his seat in September and have a lot of time afterwards to become a full time republican propagandist. Or should we say "itinerant preacher"? Even The Age's editorial admitted today: "The increasing likelihood is that a federal Coalition government led by Tony Abbott, an ardent monarchist, would consign a republic to the political deep freeze for at least a few more years. " According to internal polling, Wayne Swan is about to receive a well-deserved and long overdue ''efficiency dividend'' from his electorate (4/6). Can't wait. Seen at Federation Square in Melbourne. 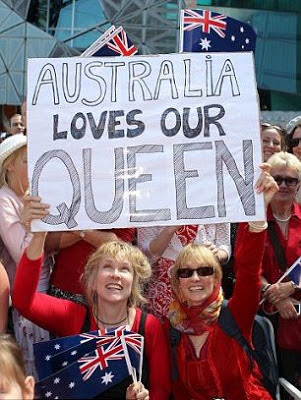 It goes without saying, that The Age, like the ABC, has totally ignored The Queen's Diamond Coronation Jubilee. All they could publish was a re-print from The Sunday Telegraph last Wednesday, 29th May: Working overtime. No wonder, The Age no longer uses the PR sloag: "If it matters to you, it's in The Age." Such an obvious lie wouldn't work anymore. Proud to be a Queenslander! We were the state the returned the most resounding rejection of the republic in the 1999 referendum, living up to our name. Bah... who cares about the opinion of some newspapers? After some hours, they just serve to polish windows, nothing else.